Whether taking a guided tour or exploring on your own, there are miles of trails for snowmobiles through vast forests, reaching open play areas and vistas that look over entire valleys. Thousand Peaks offers only top quality in snowmobiles and equipment. Make your next adventure the memory of a lifetime. 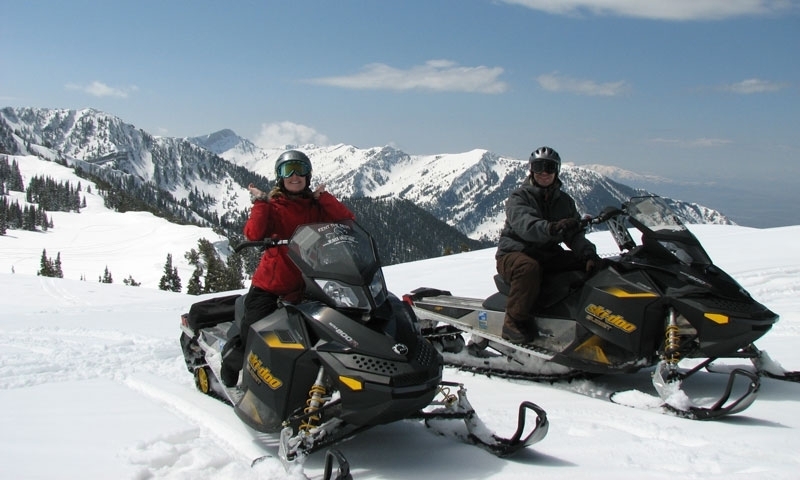 Because the National Forests, ski resorts and private ranches are so close and accessible, it's no surprise that Park City snowmobile rentals and guided tours have developed as quickly as they did. Promoting and protecting the interests of the community around Park City, Utah snowmobiling has received considerable support regarding maintenance, development and access to dedicated trails. With 70 miles of trails winding through the state park and National Forest, this is one of the premier locations for Park City snowmobiling. The complex even includes warming stations to help shake off the cold. Mill-Flat Tibble Fork is a popular 15.7-mile trail, passing play areas, the Wasatch crest and views of Mount Timpanogos before descending into the American Fork Canyon. Also popular, the Midway Reservoir Trail is an easy 4.8-mile spur to the reservoir. Found just a few miles east of Kamas, this facility has trails that head up to 10,000 feet in the Uinta Mountains. Four access points mean there's plenty of variety within the area, and there are warming stations strategically placed. Try out the 35-mile Mirror Lake Highway, accessing the frozen namesake. The southern section of the 22-mile Soapstone Trail connects to the Strawberry Snowmobile Complex, extending trail possibilities considerably. This area is best known for wide-open play areas within easy access of the trailheads. In addition, there is a good variety of trails, including groomed trails for beginners to try out. The 10.5 miles Wolf Creek Trail is popular for hill climbs from the Hanna Trailhead, while the Co-op Trail follows switchbacks up the mountain, accessing incredible views over Strawberry Valley. Found in the immediate vicinity of the reservoir and river of the same name, the complex has some of the best maintained public trails in the area and plenty of play areas to cruise around. The Daniels Loop Trail is perfect for beginners, being well-maintained along the entire 25.6 miles. Both the 11.5 mile Strawberry River Trail and the 37.5-mile Strawberry Trail are popular options as well. An attractive feature about this Park City, Utah snowmobiling area is the location. Immediately adjacent to the Flaming Gorge National Park on the eastern side of the Uinta Mountains, trails continually offer incredible views of the brilliant sandstone ledges. Designated a National Scenic Byway, the 31.6-mile Red Cloud Loop only increases in beauty in winter. Both the 22-mile Don Hatch Trail and 11-mile Bassett Springs Trail challenge advanced riders in their narrow and steep hill climbs. Most tour companies lead visitors through a combination of private ranches and public land. Connecting with a company that offers these types of tours can make for a unique experience, where off-trail riding is encouraged and traffic is low. Whether it's your first time or you're an advanced rider, contact the companies below to arrange the guided tour or Park City snowmobile rentals that your group requires. Go Snowmobiling is an informational site about learning how to snowmobile, where to go, and who to go with. Find links to snowmobile directories by state and snowmobile reviews.